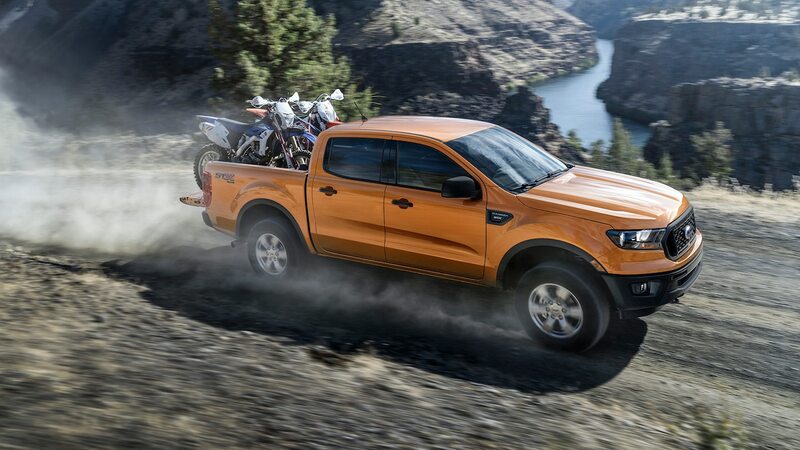 The Ranger platform is also the foundation for the Ford Bronco SUV coming in 2020. This is part of a plan to replace 75 percent of Ford’s lineup by 2020, dropping the average age of the portfolio from 5.3 years now to 2.3 years by the new decade. It was welcome news for dealers, but there are lingering concerns about Ford’s decision to get out of sedans and many car segments. Ford will continue to offer cars, just with a different silhouette than a sedan, said Kumar Galhotra, president of Ford North America. Sedans have gone from 57 percent of the market in 2010 to 23 percent in 2019. Even a good vehicle in a segment that’s dying is not a good investment, he says. Investing in SUVs, trucks, and commercial vehicles is more prudent and, in the end, the total number of nameplates will increase from 20 today to 23 by 2023. Dealers are also concerned about losing entry-level cars at a price point for first-time buyers. Farley has assured them there will be vehicles below $25,500, such as EcoSport and Escape, but they don’t dip into Fiesta pricing territory. As important as the product reassurance was hearing from Hackett and his team about the direction they are taking the company in a time of uncertainty and swirling questions. Hackett is leading an effort to cut $25.5 billion in costs and spend $11 billion to transform the automaker, which will necessitate cutting salaried workers and retaining talent in the interim. Ford stock remains below $9 a share as Wall Street questions the soundness and speed of Ford’s restructuring. This week we got a better understanding of how top managers have spent the last year. Galhotra has been shaking things up in North America by reorganizing product development around nameplates—looking at the business through the lens of product. The 11th floor has been transformed into a series of franchise rooms: Ranger, Transit, etc. There are 13 product rooms and four process rooms for topics like consumer experience. Inside each room, the walls are plastered with information from every discipline that touches that product. The visual onslaught means sales and marketing people now know engineering and manufacturing data, purchasing chiefs see intimate details from design, and engineers digest customer profile and competitive pricing. No one can plead ignorance on any subject. The info swapping has raised the business literacy of all and led to surprising discoveries, like the fact that Super Duty pickups have a profit margin of $10,000 in some regions and $20,000 in others. This makes it easy to decide who gets trucks when inventories are low. On Wednesdays Galhotra, the chief financial officer, and heads of sales, marketing, and product development form an entourage that travels from room to room to see how the vehicle is shaping up, answer questions, and make decisions on the spot. Example: stopping production of Expeditions with a four-inch infotainment screen because those models were sitting on lots while SUVs with eight-inch screens were snatched up. The soul-searching has also led to a shakeup on the marketing side by reducing the role of long-time ad agency WPP and bringing in BBDO as well as Wieden + Kennedy for some projects. Some work is also being brought in-house, with 100 employees being added to develop Ford’s message and voice. A new advertising campaign debuts this weekend around the tagline “Built Ford Proud.” It continues the “Built Ford Tough” message but introduces the message that Ford is a 115-year-old family-owned company and employees are damn proud of what they build. It grew from an “aha” moment when the automaker realized it had let its leadership in retaining loyal customers slip. “When we saw our lead shrinking we knew we had to take action,” Farley said. There are 13.5 million F-Series trucks on the road. Time to reward anyone who has owned a Ford nameplate rather than spending most of the budget on trying to entice buyers from other brands. Next year Ford will introduce FordPass Rewards, a customer loyalty program—think Delta frequent flyer—with an emphasis on offering a better customer experience. With the decision to put modems in all new Fords to make the vehicle an extension of your smartphone and its apps, the automaker has the tools to help make the lives of its customers easier, whether it is getting an oil change or applying for Ford Credit, Farley says. The reaction of dealers to this onslaught of information was relief, optimism, and some rebuke for not sharing some of this months ago to ease their concerns. They also like the promise that time from order to delivery of a new vehicle will be cut from 82 days to 38 days which will make it easier to have the right stock on the lot while freeing up working capital.